Mars lost its global magnetic field billions of years ago and now just has remnant “fossil” magnetic fields embedded in certain regions of its surface. 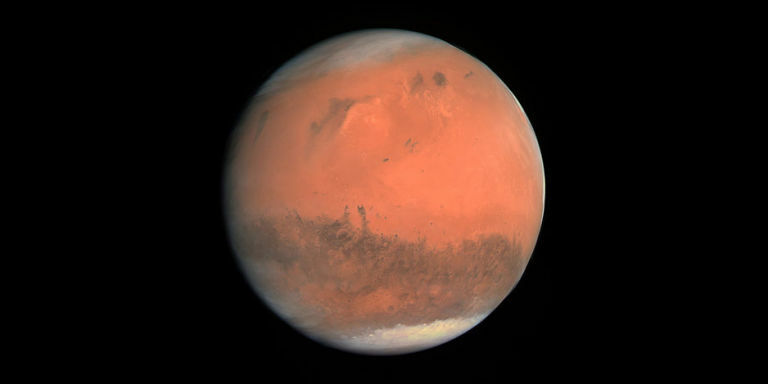 According to the new work, Mars’ magnetotail is formed when magnetic fields carried by the solar wind join with the magnetic fields embedded in the Martian surface in a process called magnetic reconnection. The solar wind is a stream of electrically conducting gas continuously blowing from the Sun’s surface into space at about one million miles (1.6 million kilometers) per hour. It carries magnetic fields from the Sun with it. If the solar wind field happens to be oriented in the opposite direction to a field in the Martian surface, the two fields join together in magnetic reconnection. The solar wind is a plasma. The solar wind is a stream of charged particles released from the upper atmosphere of the Sun, called the corona. This plasma consists of mostly electrons, protons and alpha particles with thermal energies between 1.5 and 10 keV. Embedded within the solar-wind plasma is the interplanetary magnetic field. So Mars is losing atmosphere at the rate of 165 tons per year. So 1 billion years ago had an additional 165 billion tons of atmosphere, is that a lot or next to nothing ? Amusing how they combine “lines” with fields almost in the same breath to describe the phenomenon. One of many misconceptions that dies hard..
A magnetic field line or magnetic flux line shows the direction of a magnet’s force and the strength of a magnet. The idea of lines of force was invented by Michael Faraday. His theory is that all of reality is made up of force itself. His theory predicts that electricity, light, and gravity have finite propagation delays. Einstein’s theory agrees with this. The ‘as if’ in as if they were physical phenomena obviously tells us they are not 3D physical phenomena. Therefore they can’t ‘break’ or ‘reconnect’. Something is missing, in the terminology at least. Btw what are Wikipedia’s bubbles of magnetic field? At least the portion concerning a magnetic field present in the solar wind is intelligible. Plotting the shape of that field is difficult enough. But when more than one field is present it becomes a complex problem, because (aside from permanent magnets) the fields are not constant. A single magnetometer in motion around an astronomical body is not going to reveal anything but the instantaneous intensity and direction at that particular location and moment. By itself, it cannot distinguish between multiple fields merging or opposing, much less direction. A proper sensor would be constructed of multiple sensors like the rods and cones of the eye, which is a feat of engineering by itself, since a sensitive magnetometer creates a localized field of its own. It always seemed one-sided and peculiar to me that an electrical engineer is required to take several courses in higher mathematics from the mathematics dept. But the “astro” students are not required to take a single, solid course in magnetics from the engineering dept. Thus we have these “alchemical” wizards formulating grand, rude theories about astro-magnetics and claiming to confirm them when they can’t even distinguish between the descriptive verbiage of their models and the actual phenomenon. Faraday used iron filings as a rude field indicator, and had sense enough to realize clumping of particles was not necessarily an indicator of the field itself. Since then no one seems to have developed a better instrument for revealing the 3 dimensional character of a magnetic field, especially one created by the uniform movement of electric charge. Plasma is not gas is not plasma. Iron filings in a magnetic field are created like plasma filaments. They allign in chains thereby creating their own magnetic field. All these fields have the same polarity and they repell each other which automatically alligns the filings in threads. In reality there are no magnetic lines in nature, but homogenous fields which can be disturbed or structurised like the filings do, like the ions do in plasma “lines” or plasma filaments. Since electro-magnetism is such a vast force, these lines or filaments can be scaled up to very big structures – even hundreds of lightyears long. Those gigantic filaments are not called field lines by astronomers but in essence they are. Those filaments in space are the consequence of electrically charged particles/atoms floating in a electro-magnetic background-field. Plasma filaments in space behave like accelerator tubes which can accelerate ions up to very high speeds which can be missinterpreted as very high temperatures since temperature is defined by the movement of particles. Plasma tubes are very elastic and they do stretch and shrink in pulses which create regular radio waves which can be missinterpreted as pulsars. If there’s enough plasma nearby, those tubes will be accelerating matter in pulses and at the same time create radio-pulses and if the glowing plasma is dense enough even light-pulses – see crab nebula. I allways think of electro-magnetism as the dominant force and gravity as a secondary effect of that force and consequently most pieces fall into place by themselves while considering the latest “surprising” discoverys made by NASA/ESA etc. Something tells me that’s not what today’s science bigwigs want to hear.